Join us for a compelling and important discussion about affordable housing policy and development on October 12 in the evening. 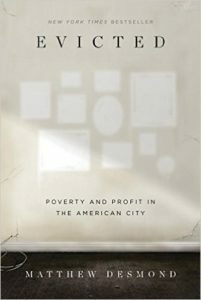 We will be discussing Evicted, Poverty and Profit in the American City by Matthew Desmond. It’s a great read, and will spark an interesting conversation. We pushed back the event date to give you more time. So, get the book, and start reading! Parking/Transit Information: Memorial Park Gold Line Station is a short walk away.